Easily used by anyone, anywhere. An ideal installation location can be found while moving. Channels can be set by using a rotary switch. The tool for construction is ideal for people who install wireless equipment in houses or other buildings. This checks the environment for 2.4-GHz wireless communication (IEEE 802.15.4 and ZigBee®). *1...A repeater (ZigBee® router) is separately used. Only one repeater is supported. -> The channel to be tested can be easily set up on the spot. The test can be conducted according to the purpose. In addition, because the checker operates on a battery, it can be used anywhere where there is no power outlet. -> Communication check with the main unit will be completed in about two seconds, and the results will be indicated by the LED on the extension. Ideal installation location can be found while moving. wireless environment in three-dimensions to find the ideal location for installation. Channels can also be set by using a rotary switch. This tool checks the 2.4-GHz communication environment between two points in a short time. In an environment where the situation changes with time, therefore, there may be a difference between the communication environment where the system should actually be introduced and the results of the checker. Taking this into consideration, effectively use the checker. If it is necessary to evaluate a long-term communication environment, consider using Ad-Sol Nissin's ZigBee® communication environment evaluation system. By increasing the number of measurement points and collecting the results of the environment investigation by this checker, the wireless environment level can be grasped by viewing the isobaric image shown below. Determine the location to install equipment while checking the communication status in order to avoid unnecessary problems of installing the equipment where the wireless environment is poor. * This module can be used anywhere in Japan because it uses a communication module approved by the Japanese Radio Law and Technology Union. 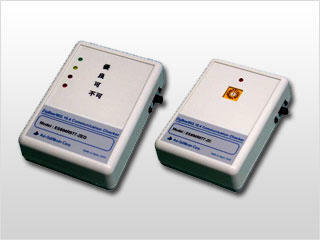 This checker can easily verify the communication status of ZigBee® on the spot. Ad-Sol Nissin also uses this checker when proposing or introducing a system to customers.